A hall load of new features. Parallax's original VirtualSoundStage was an algorithmic reverb effect that gave you a bird's-eye view of a typical concert hall stage. Positioning a cursor on that stage produced a reverb response that placed your sound in that position in the stereo panorama. No theory, just a reverb that was ready to go. There were options for adjusting absorption, adding predelay, changing the reflection mix and some rudimentary filtering for more advanced use, but what we really wished for in VSS was the ability to hook multiple tracks up into one instance of the plugin and place multiple cursors together. We wouldn't have said no to more reverb environments, either. Enter VirtualSoundStage 2, and our wishlist has clearly been received and dealt with by Parallax Audio's fulfilment centre. Version 2 finally opens up the hall to multiple instruments, allowing you to route plenty of separate tracks and position them coherently from one window (see pic). Unfortunately, you'll still need one instance of VSS2 per track to set this routing up - when you're done, the whole shebang will be accessible from each one of those windows. New environments (only available in the Pro version) include an additional concert hall, two scoring stages, a recording studio, an opera stage setup, a chamber (for 'chamber music' settings, not err, torture), a church and a cathedral. You can even use the Free Field option to use VSS2 as a straight replacement for your DAW's pan controls. Not stopping there, a number of virtual microphone setups are now available, emulating a selection of traditional stage-miking strategies including the Decca Tree formulation. Individual mics in each setup can also be moved around the stage as you see fit. 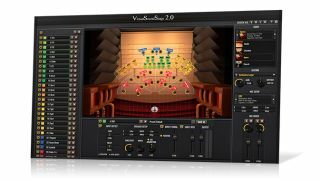 VSS2 also comes replete with presets to use it easily with some of the top orchestral ROMplers on the market today (Vienna Instruments, East West, Project SAM, etc). Get VirtualSoundStage 2 at the Parallax Audio website - it's available as a VST/AU/AAX plugin in both 32- and 64-bit versions. The Lite version will cost you $129, the Pro $229; you can upgrade from VSS1 for $24/$99. Pro features 14 whole microphone setups (as opposed to four) and nine rooms (as opposed to one).